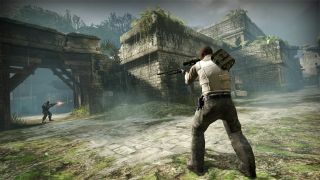 Counter-Strike: Global Offensive had one of its best ever months after going free to play, and a record number of VAC bans were doled out on Steam as a consequence. Over 600,000 accounts received VAC bans in December, with the first wave of bans happening days after CS:GO shed its price. Spotted by Nors3 on Twitter, five waves crushed naughty players throughout the month. Hundreds of games use Valve’s anti-cheat system, which ostensibly (if not always in reality) detects cheats and automatically bans the account in question from playing on VAC protected servers, but after CS:GO went free to play, the number of bans sky-rocketed. In November, only 103,743 accounts were banned, according to SteamDB. That’s around six times fewer than December, and it was a pretty standard month. The number of bans in a month has never broken 200,000 in 15 years, so it’s a significant leap to get past 600,000. The move to free to play and the addition of a battle royale mode drew the ire of some existing players, who then review-bombed the game. Things have settled down since the initial reaction, however, with recent positive reviews outweighing the negative ones.